Yesterday I had the best storytime! You know the kind where the kids are just so into it, engaged, and enthusiastic that you leave with a smile on your face and warmth in your heart and feeling guilty for getting paid to do this (well, almost 😉). So I get there and introduce the topic, and one of the kids asks me if I have a "Froooogggggyyy!" 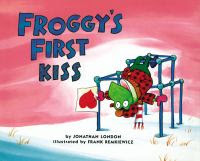 book, which made my day because I love reading Froggy's First Kiss. I said I just might, but he'd have to wait and see. So we continued talking about how we loved different people and things in different ways, did our letter-of-the-day (Ll), and sang our story song. They were still asking for a Froggy book, and were thrilled when I pulled out Froggy's First Kiss, of course immediately going "Ewwwww" at the mention of a kiss. They helped say "Froooggggyyyy!" each time, laughed at Froggy staring at Frogilina and bumping his head, identified the treats, were appropriately grossed out by Frogilina's unexpected kiss, and empathetic when Froggy's friends teased him about having a girlfriend. One little boy was very puzzled as to why Frogilina kept giving Froggy food, saying "He has his own food at home." As soon as we were done, they said "Let's read another one! ", and someone asked for a dinosaur book. Well, lo and behold, I luckily had Dinosaur Kisses, another favorite of mine (I'm a sucker for dark humor), and they stomped, and chomped, and giggled at all of the unfortunate outcomes of Dinah's attempts at kissing. Of course in their childlike innocence, they assume everyone is okay in the end, and the creature she accidentally ate would somehow get out and be fine. 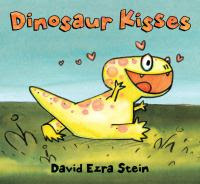 In the beginning I asked if they would let a dinosaur kiss them, and a few said they would, but by the end, they all agreed that they would not want dinosaur kisses! Once again, as soon as I finished that book, a chorus of "Let's read another one!" 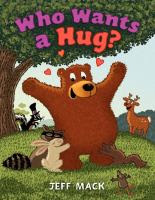 rang out, so I pulled out another book I knew they would love, and that I really enjoy, Who Wants A Hug? by Jeff Mack. In this story, Bear loves to give out hugs, and everyone likes him, but Skunk, who is secretly jealous of Bear's popularity, does not like hugs, is grumpy, and no one likes him. Skunk decides to play a series of stinky tricks on Bear, trying to make him so stinky that no one will want to be around him anymore, but every trick backfires and Skunk ends up even more stinky that before! In the end, he gives in and accepts a hug from Bear and discovers that Bear was right, hugs are great! The kids all love the humor in this book as trick after trick backfires and gets Skunk instead. "Let's read another one!" Normally I do work in some extension activities, but when the kids are so engaged and beg for more books, I can't say no! And really, my main goal is to first and foremost try to establish a love of reading. While our time was up, since it was my last session of the day I could spare the time to indulge them with one more story. 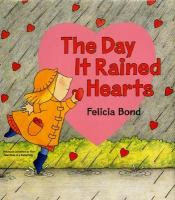 I decided it was time for a story that was more sweet & sincere than funny, so I pulled out The Day It Rained Hearts by Felicia Bond. I love this cute little story, but I HATE that they printed it soo tiny, and didn't even use the full page at that. So I made props to go with it, and someday I'll remember to copy & enlarge it. 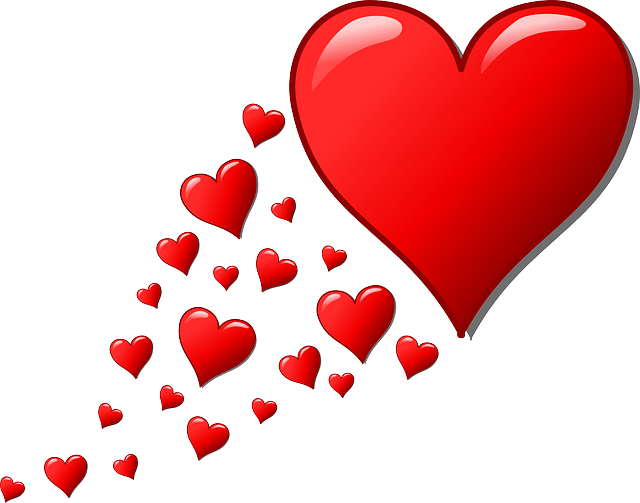 One of the kids did correctly guess the necklace of hearts was for a dog (another said her mom), but they thought it was very strange when she glued the cottonball to another valentine, and cut holes in still another. They loved it when we saw at the end that there was a very logical reason for gluing a cottonball in the middle of a valentine, after all. One little boy was so cute, at first he was a bit zoned out, but for some reason this story and the idea of it raining hearts really got his attention! Afterward, he told me all about how if it ever rains hearts here, he was going to catch them and make valentines for his friends and for me. And guess what I heard after that? Yep....."Let's read another one!".... I hated saying no, but by that point we had gone past our usual 30 minutes and I didn't want to disrupt their schedule, but I could've kept sharing stories with them until my voice gave out, as long as they were that enthusiastic and engaged. I just love seeing kids excited about stories, reading, and learning, and I sincerely hope it carries on beyond storytime! I just love seeing the kids really connect with the books, and the more engaged they are, the more I get into it. While I'd like to think it was because I'm such a spectacular storytime planner and presenter, I think it was just one of those times that the kids were in just the right mood and everything just came together perfectly. I'd done 4 other storytimes on the same theme of Love/Valentine's Day at another daycare that morning that were fine, but there was something magical about this last one. There is a world of difference between the two daycares to start with; the first was a large, church sponsored daycare/preschool with mostly comfortably middle-class, educated families. The latter is a very small daycare with mostly the kids from lower income, working class families. These kids tend to be much more appreciative of books and storytime, while the others enjoy them, they also take it for granted because they have many other opportunities so it isn't as special for them. I'm so glad we are able to bring this experience to those kids who might otherwise miss out, and it's so rewarding to see them enjoy it so much. I hope everyone has an awesome Valentine's Day! Or just a Wednesday full of love and happiness, for those who don't celebrate it.